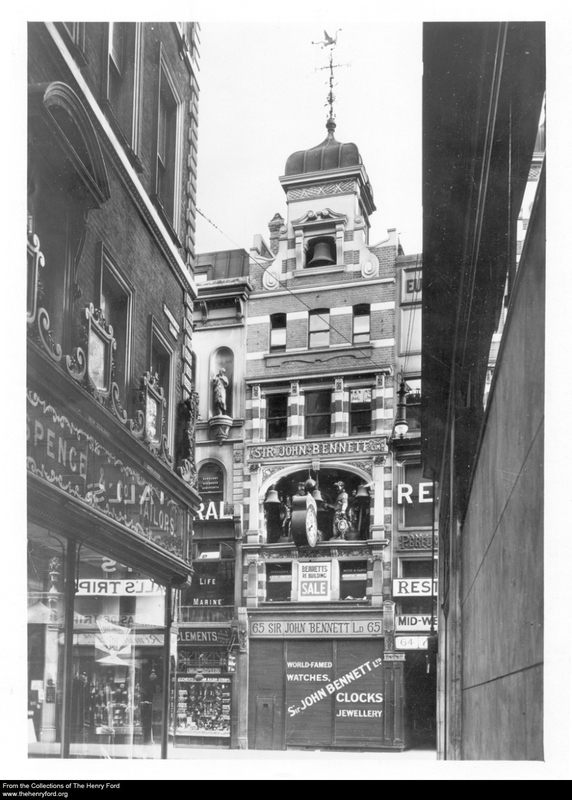 John (from 1872, Sir John) Bennett started his career in Cheapside between 1839 when the shop at number 65 was still occupied by Rigge & Co, perfumers and cutlers, and 1847 when the Tallis Supplements came out. Before that, he had a shop in Stockwell Street. 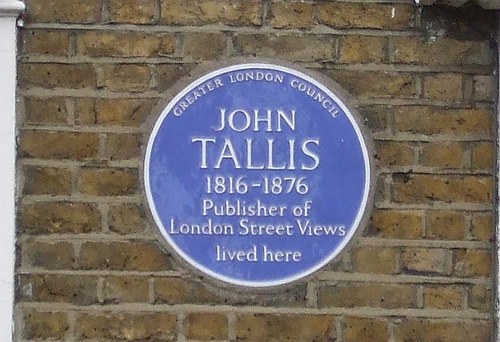 According to the ODNB, he was born in 1814 in Greenwich, the son of John and Elizabeth Bennett. 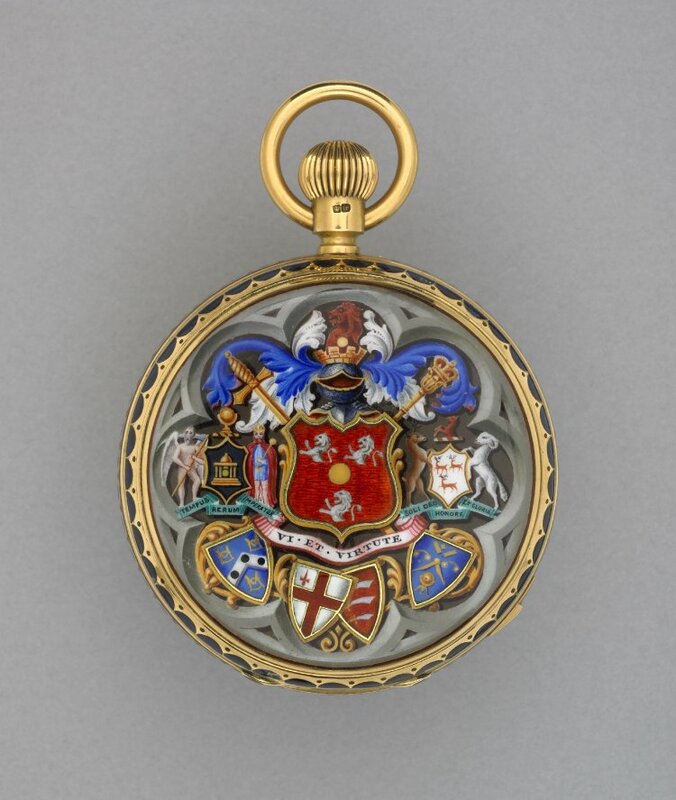 (1) Father John was a watchmaker and John junior continued in that line of business, first in Greenwich where he assisted his mother after she became a widow, but later on his own account in Cheapside. He married Agnes Willson in 1843 and the couple had three children, Alice, John and Juliet, as we can see from the 1851 census. In 1861, the family no longer lives above the shop, but in Camberwell. Son John has unaccountably been given the name of Thomas, but we’ll assume that is a mistake by the census recorder. In 1871, Agnes and Juliet are still living in Camberwell, in the appropriately named Pendulum Cottage. Agnes is still called ‘wife of watchmaker’, but John is not there. He is back, however, in the 1881 census; Agnes and John are then living at Glen Druid, Park Road, Chislehurst. Agnes dies in 1889 and in 1891, John is found as a widowed and retired watchmaker boarding in Rotherfield, Sussex. So far an ordinary family history, but for the fact that John is boarding with the ‘widow’ Aimée (also called Annie) Guilbert, originally from Guernsey, his long-time mistress with whom he had seven children: Lillie, Lionel, Violet, Rose, Horace, Gerald Munro and Douglas Thurlow. They all took the surname Guilbert [thanks goes to Margaret Burns for help with the names of the children, see comments to this post]. There are two probate records, the first one in 1898 for Sir John Bennett of 135 London-road St. Leonards-on-Sea who died 3 July 1897. Probate is granted 1 February to Henry Hewitt Bridgman, architect, and the estate is valued at £463 19s. 6d. A year and a half later, however, a second probate record can be found for Sir John (no mistake it is him; same address, same date of death), but now probate is granted to Edward Jones Trustram, solicitor, the attorney of Aimée Guilbert, spinster. The estate has dwindled to £88 9s. 6d. (2) A notice in the London Gazette of 29 September 1899 asking all creditors of the estate to contact Trustram declares that Aimée Guilbert was named executrix in the will. I bet that did not go down very well with the children from his marriage with Agnes. Interesting as his private life may be, I will now go back to his shop in Cheapside. 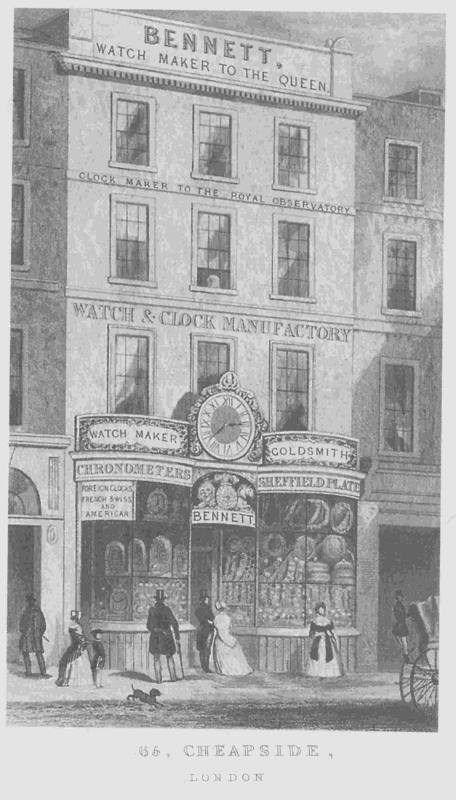 As can be seen on the vignette on the left, Bennett was “watch maker to the Queen”, “clock maker to the Royal Observatory”, and sold “foreign clocks French Swiss and American”, besides chronometers and Sheffield plate. 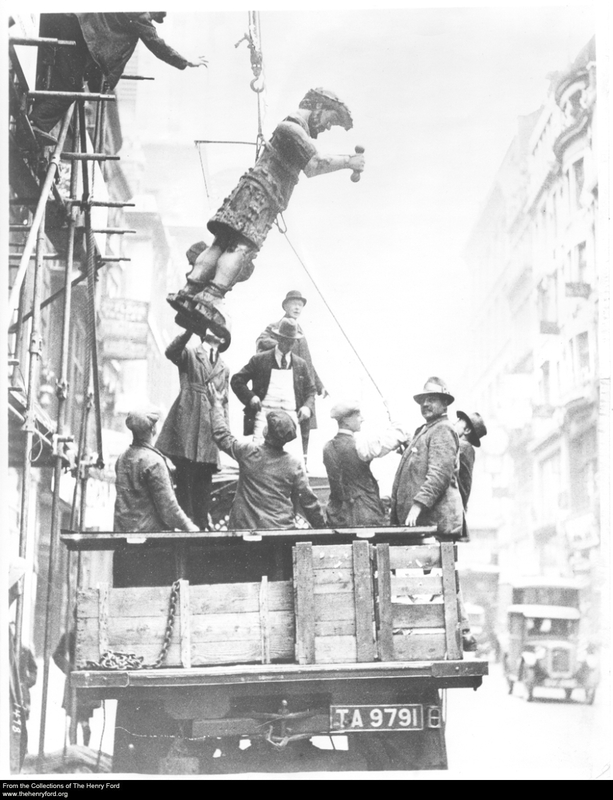 He went into advertising in a big way; no opportunity was overlooked to promote his business. 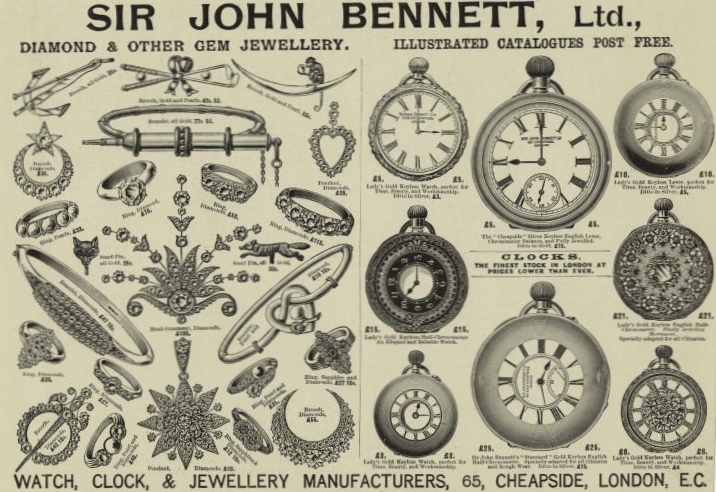 A large number of his advertisements included pictures of the various watches and clocks he sold. 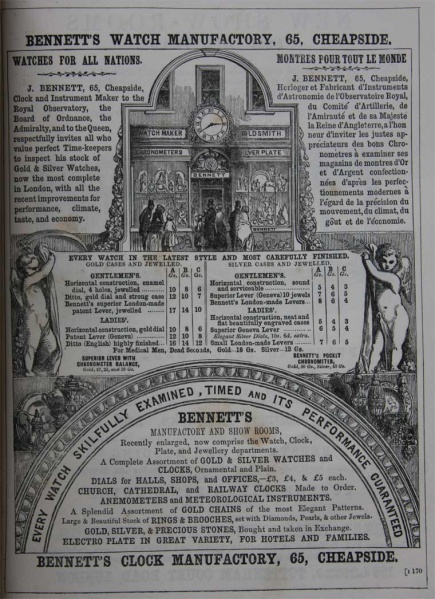 The 1851 Exhibition warranted a page-long advert in the official catalogue. Please note the illustration of the shop front. Gog and Magog at the Henry Ford Museum (Source: Henry Ford Museum). More on Gog and Magog in London here. 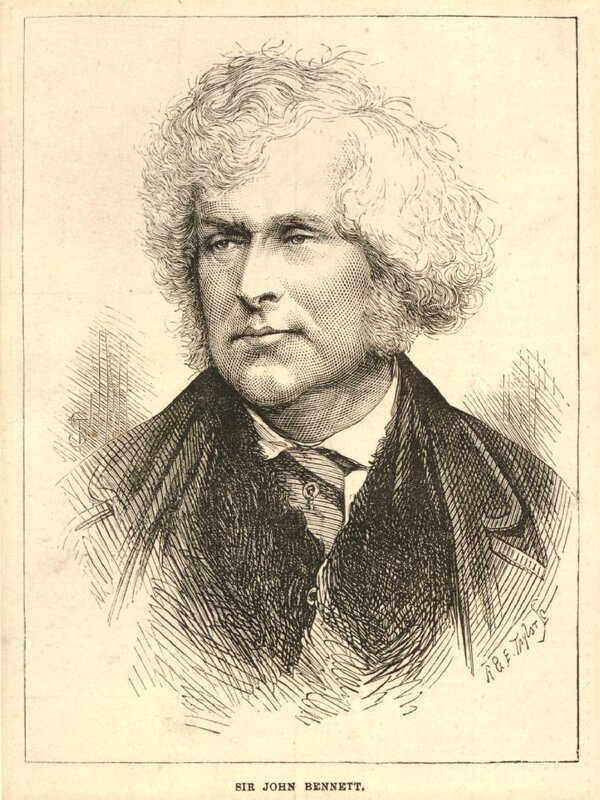 (1) Richard Harvey, ‘Bennett, Sir John (1814–1897)’, Oxford Dictionary of National Biography, Oxford University Press, 2004 [http://www.oxforddnb.com/view/article/2125, accessed 3 April 2013]. See for more information on the Bennett family here. (2) England & Wales, National Probate Calendar (Index of Wills and Administrations), 1898 and 1899. (3) W.H.J. Traice, “Education of the artisan, and employment of women” in Journal of the Society of Arts, 4 April, 1856, p.349-351. (4) Journal of the Society of Arts, 11 March, 1864, p. 277; and idem, 13 may, 1870, p. 581. (5) See here for photographs of the restoration project. You may also like to read the post on Eddels and Kerby at 64 Cheapside, which gives information on Bennett extending his 65 Cheapside shop with number 64, or the post on Crown Court where information is given on a burglary from Bennett’s shop. Thanks for the compliment. Good to read that you found a Bennett clock in Mumbai. I had no idea one of his clocks ended up there. I’m disappointed because I had been told the clock was now back in London, and as a relative it would have been interesting for me to see it. It isn’t back and I did not even know there were plans to bring it back. Sorry for the disappointment; I’m afraid you will have to fly to the US to see it. Thanks for posting this interesting article. I’ve a small silver pocket watch engraved “Bennett – Maker to the Royal Observatory”. Its a thrill to see photos and history about this fine watchmaker. I bought a gold running hare brooch recently in Hereford and the box, which appears to be the original is from the shop in Cheapside. Did he make such items? I wondered if he was a commission or a piece that they sold? Is there anywhere I can find out more about it – I would love to know how old it is! Yes, I think he made that sort of thing. If you look at the picture of the 1898 advertisement in The Illustrated London News (click on it to enlarge), you will see a monkey and a fox, so why not a hare? I would not know where you could find out, but a good jeweller should be able to tell you. Good luck. I have a manual solid 9 carat gold case wrist watch by Sir John Bennett, 21 jewel Swiss movement bought in Australia in the late 50’s but alas cannot find any information on it, a beautiful watch recently cleaned and a new crown installed. As a time keeper, the loss is around a minute in a 24 hour period. Is there anyone out there that can give me any information on this time piece. I did read that his son John came to Australia but alas that is as far as the story goes. Can you advise how I might get a Bennett pocket watch dated. I have an 18 ct gold watch, signed Bennett , 65 to 64 Cheapside & Cornhill, makers to the royal observatory, 62 Cornhill London. Hallmarks for 1862. In very beautiful condition and in it’s original box. I was particularly interested to read your historic article about the incredible watchmaker. Many thanks. Robert. Thanks Robert for your kind comment. 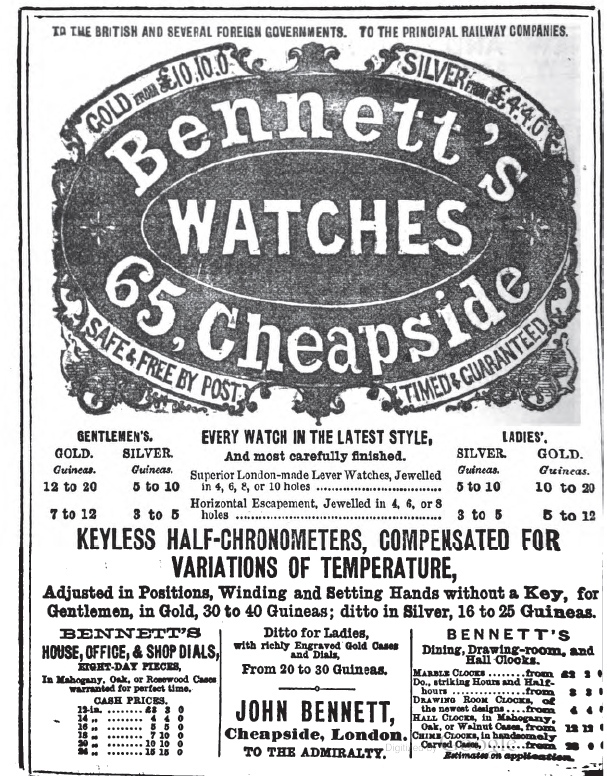 It is good to hear that Bennett’s watches are still treasured. Thank you for this web site. I’m doing some family research for my daughter-in-law, and Sir John Bennett is her GG Grandfather. All the information here was very helpful. Do you happen to know any more about his parents, John Bennett and Elizabeth Sinnock? Thanks for your kind words. I am afraid I do not know very much about the parents, but I can tell you that Elizabeth died 7 January 1864 at 7 Circus Greenwich (probate registration) and that probate of John senior’s estate was granted on 7 March 1829. His will can be found online via ancestry.co.uk. If you don’t have access, send me an email (baldwinhamey [at] gmail.com) and I will see how I can help. Hi Margaret, it was interesting to read that you are researching for your daughter – in – law, who is related to Sir john Bennett. He was my Great Grandfather. Aimee Gilbert was my Great Grandmother. I have quite a lot of interesting information on the family. Also the name of the seventh child. I am located in Australia. Would love to exchange info. Please let me know if you are interested in communicating. Kind regards. Margaret Burns. Hi Margaret, Thanks for your reply. I would love to be able to contact you directly. (Baldwin, any ideas?) Also the seventh child of Aimee Guilbert was Douglas Thurlow Guilbert and number six was spelt Gerald (Gerald Munro Guilbert) The 7 children all took the surname Guilbert. I look forward to direct contact Margaret. I’m in S.E.Qld. Kind regards, Margaret Burns. The information on the Guilbert children has been updated, many thanks for that. And I have sent you both an email with the information for contacting each other directly. Regards, Baldwin. Hello, I may be a little late to this discussion, but I do believe I am also related to Sir John Bennett (and am a Bennett!). My aunt has been doing research into the family history of the family – but cannot work out which side of the family etc our ancestry comes from. Would be interested to chat via email! Thank you for your comment. Yes, I am researching the Bennett family for my daughter-in-law who is a GG Granddaughter of John Bennett and Aimee Guilbert. I would love to contact you. I am happy for Baldwin to give you my email address so you can contact me direct. I would love to have contact with to see if I can help find where you fit into this puzzle. I am happy for Baldwin to pass on my contact email. I look forward to it. My gr-grandmother was born and raised in East London. She became an orphan at a young age and was supposedly raised in the 1860s by two Bennett sisters who were related to the clockmaking Bennett family. I’ve done some research on Ancestry, but can’t figure out what their names were and where exactly in the East End they may have lived. One family story places them somewhere in Greenwich. Perhaps one of you can help me get to the bottom of this? Thank you! Hello! So interesting to read all of this. I too am a descendant of Sir John and the Guilberts. Would love to get in contact – I am currently living in Perth, Australia, but my mum is in SE Qld and loves reading about family history. My email is caitlin@caitlinirving.com if anyone would like to get in contact direct. Would love to see any family history anyone is willing to share! I am lucky enough to be in possession of a Sir John Bennett pocket watch that my grandfather has passed onto me. I’ve recently started to research it a bit more to find out when it could have been made and it origins and came across this page. If you like, I can send you some photos of the watch for your page? Thanks for your message Mark. It must be nice to have such an historical watch. I’d love to have a photo to put on my site, with acknowledgement of course. Just send whatever you have to baldwinhamey [at] gmail.com and I’ll see which one fits best. Perhaps it even triggers some information about it from one of my readers; you never know. I recently purchased a Sir John Bennett 8 day chime clock and have done a full restoration of the clock work. It is running superbly and keeps very good time. The back plate of the brass clock work has an engraved picture of Sir John. I am based in South Africa and have added this clock to my collection. You can contact me on jamescun65@gmail.com should you be interested in more information and or photos of the clock. 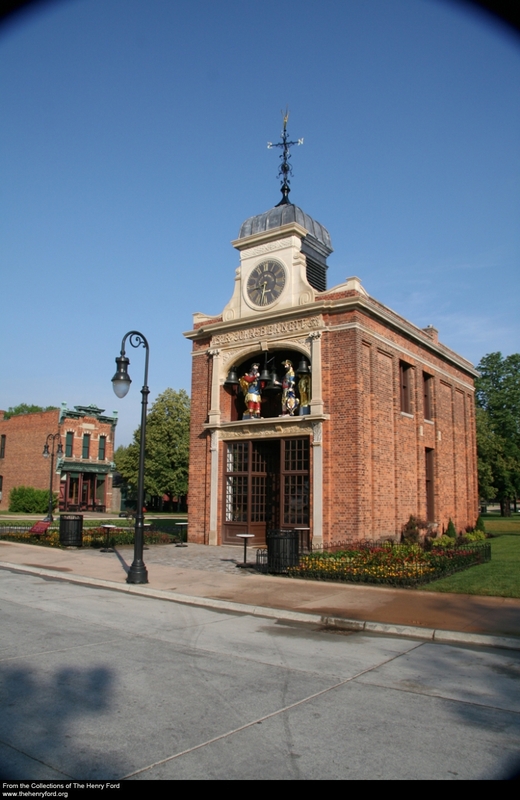 I am interested in the weather vane atop the building. It looks like the Welsh Dragon. Can any one give me information about this weather vane, please? No idea where the idea of a dragon on top of the building came from or whether Bennett had a Welsh connection, sorry. Hi i have inherited a brass ships clock with Sir John Bennett Ltd London on the face its around 10 inches in diametre is this one of his clocks do you think , did he make ships clocks. Hi. I have discovered your website following trying to research a pocket watch handed down the family from my Grandfather, to my father and now to me. Maybe it would be useful, (not sure) if I shared the information on it, First of all the watch still works perfectly and is in it’s original case. If I could post photo’s tI would! Now to the watch. It’s a gold Hunter Pocket watch that opens from the front by pressing the crown. It also opens at the back to reveal the rear of the watch case and which is engraved with a motif. The case that folds back is stamped AB 33 11 48 and there a 4 small stamps 1. a crown (crown jewels) 2. K 3. 18 and 4 I can’t make out – sorry. The motif on the back of the watch itself is quite intricate and shows a Lion and a Unicorn with lettering which to me looks like Latin. I have no idea what it means!! On the front flip open lid it has K 18 ( I am assuming that means 18K gold) plus again this AB with 4 and 8 in small stamps below. The dial itself is whiet and has a smaller diameter second hand dial. Pity I can’t post a photo. That’s basically it folks. I hope that might offer some useful info to someone. The fact that the watch works perfectly is pretty good after all these years. We live in Florida USA. Antiques dealers. We have a John Bennett mantle clock. Acquired at auction. We are thrilled to have it in our collection. “Keepitis” is a disease that antiques dealers get. Thank you for the interesting story of this family. Glad you liked the Bennett post and I can well understand your Keepitis. I know I would not make a good dealer as I do not think I could part with whatever took my fancy. It’s interesting to come across all the people related to Sir John Bennett. How are you related to him? And yes, I too am always interested in any information relating to him. I was told my mother was his great granddaughter.Her name was Daphne Josephine Bailey, born in Lambeth London. She lived until she was 96 and was born in 1914. There is a large part of the family still living in London. I am an only child and live in Eastbourne England. Have you got a family tree, one of my cousins made one, but I can’t find it at the moment. Senior moment ! Yes please , I’m not very good at all these different sites. Hello to both Wendy Ellis and Brenda Woods. Sir John Bennett was my great grandfather and my great grandmother was Aimee Guilbert. This is all very interesting and I also have quite a bit of information on the family tree. I would love to be in touch with you both (and Margaret Watson again – unfortunately my email server crashed and I have lost your contact details Margaret, did you enjoy your holiday?). I would like to communicate with all of you, if Baldwin would be kind enough to pass on our email addresses. I am in Australia. Kind regards, Margaret Burns. Of course Margaret. Have just sent them an email with your address. I am sure they will contact you soon. Many thanks for posting this article. I recently purchased one of his silver fusee watches, dated to 1871. I thought I’d paid too much. But, now having read this article I am quite pleased with my purchase. 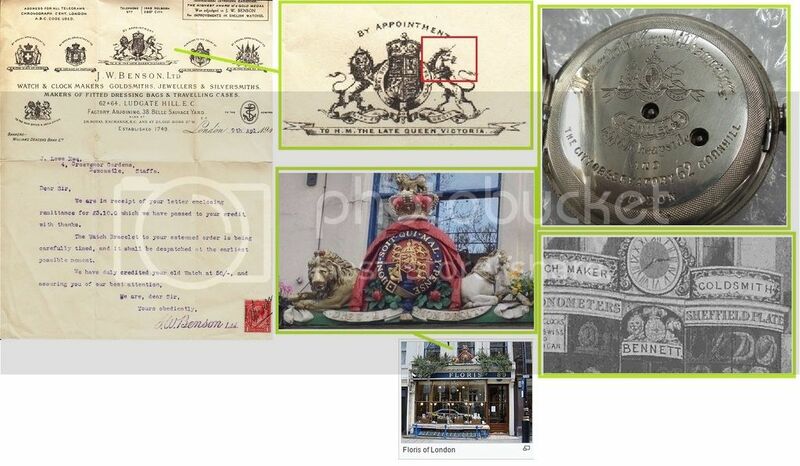 Sir John Bennett – Royal Warrant holder? Very nice picture! Thank you. I have an Art Deco style (1930s) silver sugar bowl with Sir John Bennett signature underneath. So when did the brand cease to exist or does it still exist somewhere. Bennett’s ceased trading in the late 1920s, so your bowl must date from before 1930. 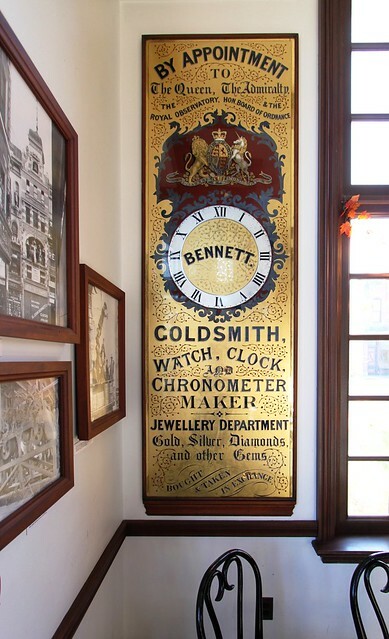 Hi John, good to hear you still have a Bennett clock that belonged to your ggdad. No idea about value though. I am a historian, not an auctioneer or antiquary. You better go to an antiquarian clock dealer or somesuch for advice. I have a fine “French” brass carriage clock which keeps excellent time. It is probably late C19th or early C20th. The face has a circular dial within a gilded oblong front. The numbers are in Arabic numerals. 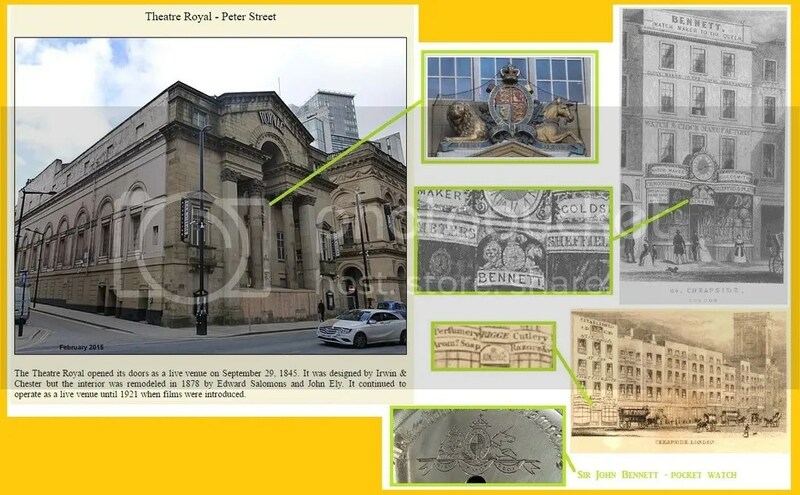 It has the inscription “Sir John Bennett Ltd” and underneath that “Paris”. I assume this is the same clockmaker. Perhaps he had a shop in Paris,given his prestige? The fine polished brass back plate within has some engraved symbols or markings on it but they are not familiar to me and I don’t know where to look them up. Any ideas? The ‘Paris’ on the clock face may also indicate that the clock was made in France with Bennet just retailing it. Hi Baldwin, I have a clock with Sir John Bennett’s signature and made in England on the face. On the inside there is an engraved photo of Sir John with the inscription, SIR JOHN BENNETT LTD. London made. On the inside of the door is the # 1379 painted in white. I would love to be able to send you a photo to see if you could date the clock for me. It has been in my family for at least 50 years and my Uncle owned it for years before that. If a watch has Sir John Bennett, it is certainly the son and the watch must be from 1872 or later as that was when he received the title. John Bennett senior died in late 1828 or early 1829 (his will was proved on 7 March 1829), so your watch must have been made by the son. I have a Sir John Bennett Ltd wristwatch from 1925, which I was told, when it was repaired, has a Longines movement. And it still works. I’ve also seen items for sale, for example a pair of binoculars and a couple of handbags labeled “Sir John Bennett Ltd, New Bond Street W1”. It looks like the business continued into the 1930s, after the Cheapside shop was sold.